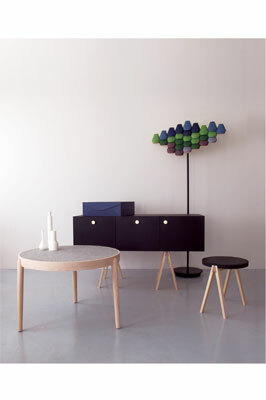 Lith Lith Lundin is a furniture company based in the small village of Torsaker in central Sweden. Their business idea is a reaction to the way the industry constantly puts forward new colours and trends in order for people to strive to buy new products and 'have the latest thing'. They offer sustainable alternatives that are not driven by trends or seasonality, and manufacture timeless furniture that will develop its own history - furniture that can be passed on down the generations. Martin Lith tells us that both himself, Erik and Hannes all had their individual ideas of what they wanted to do, as he explains: "I was going be a hotel manager; Erik had a career in soccer and Hannes was studying science, but through some random events, we all changed paths; paths that would lead us to where we are now." Erik began to study traditional handicrafts and went on to pursue design at Grimslov folkhogskola, whereas Hannes studied cabinetmaking for two years in Gothenburg while Martin worked as a salesman for hotels on the west coast of Sweden. It was not until 2009 that their paths crossed for the first time. At this point, Erik and Hannes had both managed to get in to the Carl Malmsten Furniture Studies in Stockholm, Sweden. 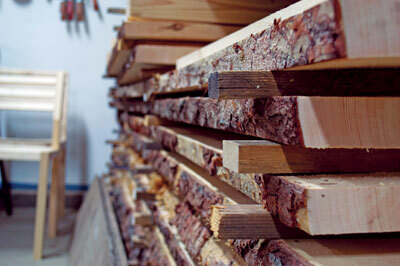 This is a highly renowned school for furniture design and furniture making with wood as its primary material. As the trio tell us, Carl Malmsten Furniture Studies is a school "based on learning by doing," with a focus on craftsmanship and the cultural heritage as a source of inspiration and knowledge. Erik applied and got onto the programme for furniture design and Hannes started on the furniture making course, and it was during one of the many classes that were included in both these programmes that they started to spend time together. As they explain: "Carl Malmstens is a rather small school with about 70 students and due to this small size, you quickly become a tight-knit group of people and you really get to know everyone." Erik and Hannes, among a lot of the other students, spent the majority of their waking time in school, sometimes playing table tennis or having a party, but most of the time working. One day in the school cafeteria, they were discussing what would happen after they had completed their studies and what they would do career-wise. They didn't want to contribute to the growing trends in design that were promoting "the colour of the season" or the latest trend, as it didn't seem like the right thing to do. "This is where the first ideas of a thesis project started," the trio explain. At the same time Martin Lith, Erik's brother, had quit his job as a sales representative at a Swedish hotel chain and started working as a lumberjack at the family farm in Torsaker and it didn't take long before Martin and Erik were asked to take over the farm and carry on the family legacy. "At the same time, Hannes and Martin had also got to know each other and the three of us had a lot of fun together," they tell us. Back at the furniture school, Erik and Hannes had started their thesis project, the title of which was originally going to focus on carbon-dioxide neutral furniture. 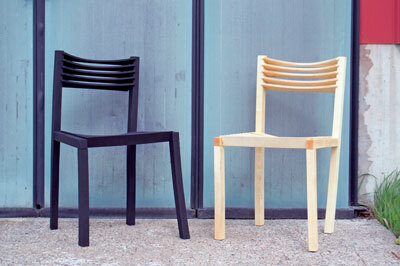 However, as they started researching, a whole new idea opened up, an idea about sustainable furniture production. "At the beginning, we didn't have any idea of how comprehensive the project was going to be and we were lucky to have such understanding, but also trusting, mentors," they explain. Over the upcoming 10 weeks, Erik, Hannes and in some cases also Martin, worked around the clock to finish the work in time for the annual thesis project exhibition. The result of the first part of the project became a flow chart, which allowed the user to put in a 50km radius and test if it is suitable for a sustainable production. In the second part, they tested their flow chart on Torsaker where Erik and Martin had just started taking over their family farm; this resulted in a palette of materials and three products: 'Glimm', 'Seven' and 'Dome'. The thesis ended up being rewarded with a scholarship from builder John Mattson's memory foundation and all of a sudden they had a business idea: sustainable furniture production within a 50km radius. As the company is still fairly new, they only have four different pieces: 'Will', 'Dome', 'Glimm' and 'Seven'. The development of 'Will' is a story in itself, while 'Dome', 'Glimm' and 'Seven' are all built on the same basic idea. "As there are three of us in the company and because we all have different answers, it's too hard to point out one favourite piece, but I guess our favourite is the simple but refined look that gets most of its inspiration from nature" they tell us. 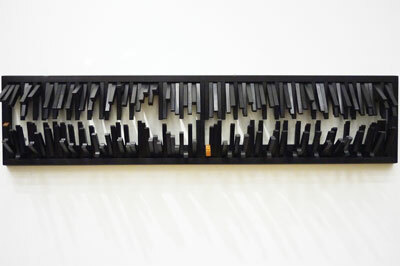 The trio explain that they particularly like the simplicity of the pieces, even if they may look a little complex. 'Glimm', 'Seven' and 'Dome' are pure and simple - no glue is used - just leather straps that hold the construction together. However, these designs are still advanced and challenging in the way that none of the legs have any wooden frame to connect them to each other. 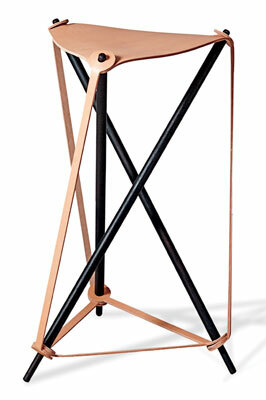 â€œThis design needs and values high-quality materials,â€ they explain. 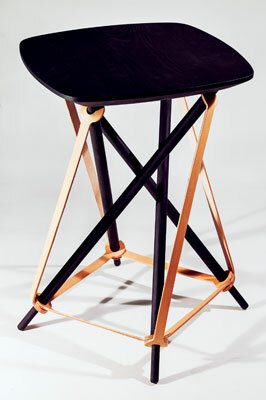 "Because of its simple shape, the materials become an important part of the overall appearance of the piece and the quality of the leather is extremely important, as it needs to be able to withstand the force of someone sitting on the stool, and it needs to be durable." As they continue: "'Will' might be even more simple and a lot more advanced at the same time. We handle and produce the parts in the same way every time but the result is still unique in the end." So how does this work? 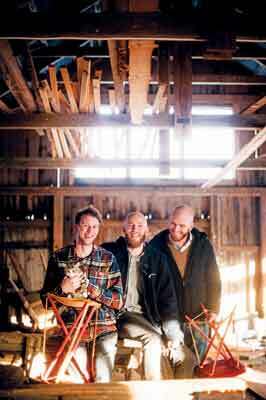 Well, the trio tell us that they use fresh wood when building 'Will' and when wood dries, it shrinks and bends. 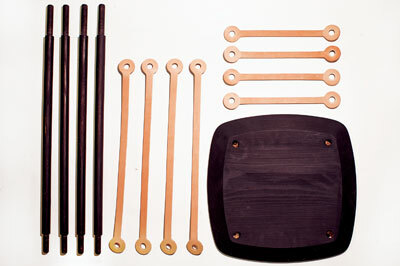 By drying and putting the chair together in different steps, they can exploit the shrinkage, using it to frame the construction and at the same time, the overall result is unique due to the natural movement of the wood. The company's concept is to source and process all their resources from within a 50km radius from their workshop. "This is to produce sustainable furniture where we have control over all steps in the process," they explain. 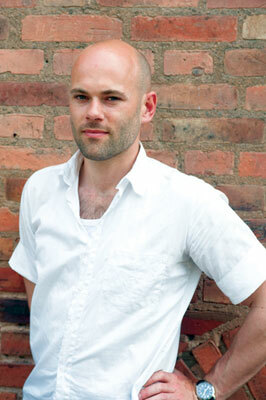 "If you claim to produce sustainable furniture, then you have to be sure that everything is sustainable. You could use organically grown and harvested wood, but how about the chemicals in your stain - how and by whom are they produced? With this 50km radius we are able to check everything, and work with transparency in our production." Working within this 50km radius provides them with creative challenges, something to take a stand towards, to accept and develop: "The fact that we only have access to a limited selection of raw materials within our 50km radius encourages us to grow and produce our own. It is this 50km radius that dictates the palette of materials that provides the premise for our design. We want to contribute towards a change in attitude in the consumer, towards increased awareness, by showing that sustainable production is possible based on the knowledge and natural resources available within our immediate surroundings. Through our project we also want to demonstrate an alternative to today's furniture industry; an alternative that makes the consumer aware, engaged and inquisitive. In this manner, we want to justify our role as a production enterprise in a world already overflowing with stuff. 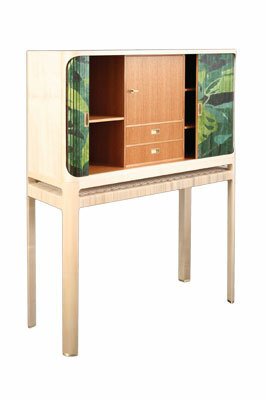 We get a lot of our inspiration from our materials and ultimately from nature. Either we try to develop a new material within our 50km radius or we start out with an old handicraft technique that we try to apply on a new material, or take a modern stance and see what possibilities that could give us." All the materials they work with are 100% renewable, biodegradable and free of chemicals. 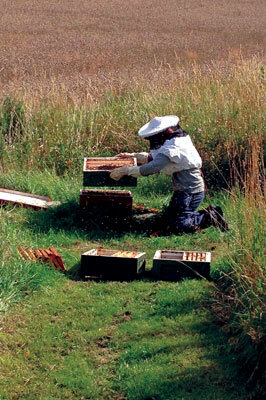 They also work to promote regrowth and biodiversity within their 50km range. They plant and use pine (Pinus spp. ), birch (Betula pendula) and spruce (Picea abies). They also use many other natural materials, such as linseed oil made from home-grown flax seeds, beeswax sourced from their own hives and pigments made from beetroot and red cabbage. They told us that their self-imposed geographical range means that they often look to old techniques for inspiration, then try to update or upgrade them. 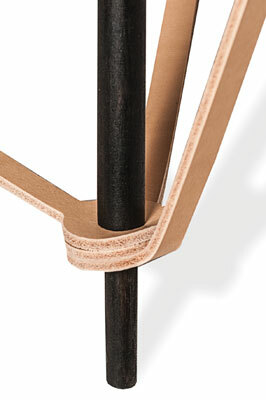 An example of this is the technique they used for making the 'Will' chair. 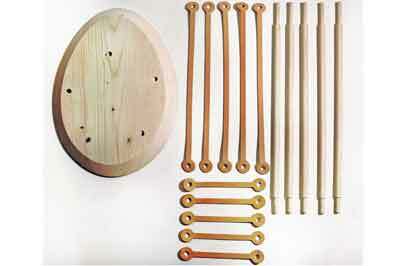 "The green woodworking technique used in 'Will' is probably one of the oldest techniques on how to make furniture: take a piece of fresh wood, drill holes and put dry sticks in them. Another example is the making of carbon black; we found the blueprints for that in a book from 1870 and then just modernised it." The form and technique used for 'Dome', 'Seven' and 'Glimm' come from tensegrity - tensional integrity - which is often used when building masts and domes. As the company only work within their limited geographical area, their materials therefore become very important to them, as they explain: "We want to make the most of everything we have within our radius that is renewable. As we live in the middle of Sweden, wood is the natural choice for the main material and we try to maximise the way in which we use it; ensuring to get the most out of this natural resource." Together with Sara Olson, a student at the university in Gavle, the trio have been working with Bois Durci, where they have been experimenting with taking wood sawdust and mixing it with blood from cattle to make a castable material. As both sawdust and blood are seen as disposable byproducts, they think this is a very interesting material and one they will certainly focus on in the future. The three furniture makers also tell us that in their work, to ensure that all materials used to make their furniture comes from within their chosen radius, they have developed a system for tracing their furniture: "Every piece of furniture comes branded with a unique number. On our website, you can trace all materials in your piece back to where they come from. For example, you can see where the cattle for the leather has been bred, where it's been slaughtered, tanned and stamped. You can see from which part of the wood the pine root for the black pigment has been collected; where the hen that gives us the eggs for the colour lives, and so on." They begin a design by looking at different materials and techniques, rather than starting with an empty sketchbook. Their approach to design is remarkably open: "Our mission is to build furniture, but we're not entirely locked into this, so what's to come out of a project is sometimes hard to see at the start." Their design process is also based on experiment and research: "We conduct countless tests of form and function. We prefer to work with models rather than computers, as this provides a better understanding of proportions, materials and their interactions. However, this does not prevent us from also using 3D modelling in CAD programs where appropriate." The future looks promising for this young company as their furniture starts to go on the market: "Right now we are in a phase where we can start to produce and sell 'Glimm', 'Seven' and 'Dome', which is very exciting. Finally we will be able to see how the market responds to our products. We just came back from London Design Festival and we are now getting back to reality and everyday life. Our goal for the near future is to start selling our furniture in stores around the world, so if a retailer is reading this and is interested in selling sustainable design, then get in touch!" We hope to see more of their work on sale soon. The trio have also been selected to take part in various exhibitions in prestigious locations, including Milan, New York and Los Angeles, so watch this space! It is so hard to pinpoint just one person and since there are three of us, the biggest influence is definitely coming from each other. But if I were to choose someone from the outside, it would probably be our friend/mentor/teacher and for a time also our flatmate Rasmus Malbert. He is always positive and open to new ideas and solutions. He has the ability to get you to make the hard decisions and force you in the right direction without you knowing it. He's a true inspiration both in a work situation and in real life!